Finance Minister Brian Lenihan has become the first Fianna Fáil Cabinet member to deliver an address at the annual commemoration of the death of Michael Collins in west Cork this afternoon. Traditionally a Fine Gael event, he told the gathering that the spirit of Collins is the spirit of our nation and it must continue to inspire all in public life, irrespective of party or tradition. He described the invitation to speak at Beal na Blá as both generous and unexpected saying that if today's commemoration can be seen as a further public act of historical reconciliation, at one of Irish history's sacred places, then he will be proud to have played his part. And he pondered what might have been if Collins had lived - would the party he, Brian Lenihan, belongs to have been pre-empted by the party Collins would have created? He also referred to Collins role as Minister for Finance between 1919 and 1922 saying here was a man at constant risk of arrest and death, running a ruthless guerrilla war and masterminding the highly efficient intelligence system which secured its success. Yet he still had the time to build the foundations of a system of financial control. 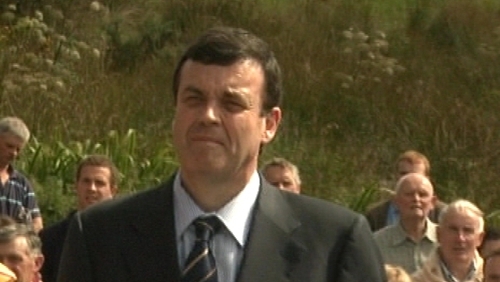 Mr Lenihan added that while there is no substantive connection between the economic and financial position the country faces today, and the challenge faced by Collins, he is comforted by the essential resilience of the country, of the political and administrative system and above all, of the Irish people. Devastating though the effects of the crisis have been on the lives of so many citizens, he said he remains convinced the country has the ability to overcome its present difficulties. Michael Collins was shot dead in a gun battle 88 years ago today at Béal na Blá. He was the leader of the Free State Army which was engaged in a civil war with anti-Treaty forces at the time of his death. The Chairman of the Béal na Blá organising committee, Councillor Dermot Collins, said it was time the oration was delivered by someone senior in Fianna Fáil. However, the decision has faced some opposition, including that of Young Fine Gael, which planned to boycott this year's event. It says it is not against the speech being given by people not associated with Fine Gael, but it opposes Mr Lenihan's presence whose policies, it says, has put the economy at risk.